I think it’s pretty safe to say that JAWS is the best shark film ever made. The 1975 adventure-thriller was so deliciously good that it scared the bejeesus out of a generation of ocean swimmers and kept them onshore for years afterward. Even today, John Williams’ Oscar®-winning two-note theme evokes waves of spine-tingling shivers… and more than a few smiles whenever it’s played. Not surprisingly, since JAWS came out, we’ve been blessed with a myriad of other films, documentaries and reality shows dealing with sharks. No matter how downright frightening each fish was though, not one of these productions came close to the roller-coaster thrills that JAWS gave us. Now, 43 years later, another shark film has come along to try to dethrone the king. Very loosely based on the 1997 book, Meg: A Novel of Deep Terror, by Steve Alten, THE MEG tells the story of a group of marine scientists working at an underwater research facility who, while investigating the possibility of life existing at the bottom of the Mariana Trench, are attacked by a 22-meter prehistoric shark known as a megalodon. 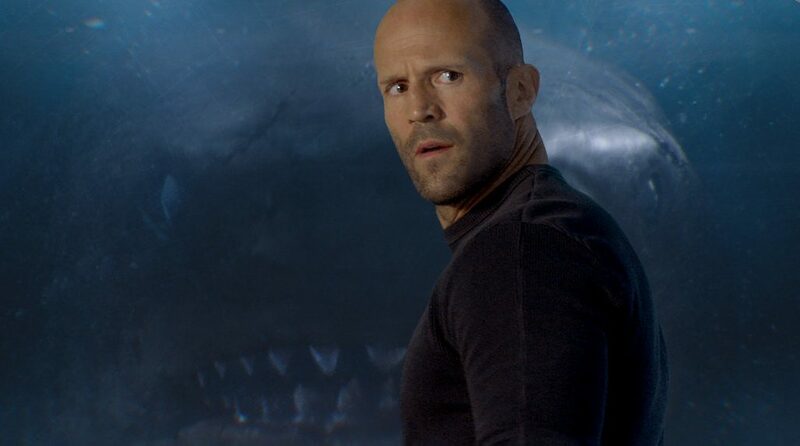 When the team’s submersible is disabled by the toothsome leviathan, Jonas Taylor (Jason Statham, SPY), a disgraced rescue diver with experience at extreme depths, is called in to save the crew, one of whom just happens to include his ex-wife. He does, but in the course of the rescue, a hole is created in the cold water layer that had been keeping the fish at the bottom of the ocean. Now, back on the surface, Jonas and the team of scientists and engineers that includes the beautiful Chinese oceanographer, Zhang Suyin (Li Bingbing/李冰冰, RESIDENT EVIL: RETRIBUTION), must try to kill the “meg” before it kills them and everything else that’s swimming in the oceans. I’ll start with the positive: The film is not a train wreck. The story is coherent, the acting is acceptable and the images are all in focus. Okay, I’m done. Now for the negative: It’s completely dumb, and it’s blatantly tailored to appeal to the mainland Chinese audience. Not that having a Chinese actress in the cast is a problem except that the book’s secondary character is Japanese, not Chinese. Here, we have the love interest being Chinese as well her research facility head father (played by Taiwan’s Winston Chao/趙文瑄, THE WEDDING BANQUET), her wise beyond her years, 8-year-old daughter, and half the population of China who seem to be swimming at the beach at the country’s southern resort city of Sanya where the shark just happens to go to look for its next meal. Maybe it wanted to dole out some karma for all of its brothers and sisters who lost their lives in the name of shark’s fin soup over the years. Seriously, I get it though. Hollywood studios have discovered that if they get Chinese backing and maybe cast a couple of A-list Chinese stars, their film will get distribution in China and will go on to make a gazillion dollars at the box office. That’s why we’re seeing more Hollywood films these days being co-produced by likes of Alibaba, Tencent, Huayi, Wanda, Legendary and, as it is in this film’s case, Gravity Pictures. It’s all about the money. THE MEG, however, really takes the pandering to a whole new level and that’s a problem. Interestingly, the rest of the cast is incredibly diverse, perhaps more so than we’ve ever seen on the big screen before. There’s the loyal Maori team leader, the Australian post-punk computer programmer, the African-American who looks smart and cracks a few jokes, the tender Japanese (played by Masi Oka, TV’s HEROES) who does something else, the post-slacker long-haired white computer tech guy, and the blonde all-American white woman who pilots the submersible. Could they have gotten more politically correct? If the casting director had a checklist to work with, every box was ticked. The biggest problem with the film, however, is that it’s neither gory nor scary enough. Sure, a couple of people get eaten by the shark but not nearly enough of them. Back in 2015, Eli Roth (DEATH WISH) was in talks to direct the film. If he had, this would have been a very different – and a much better – film. Instead, we got Jon Turteltaub, who is better known for producing the NATIONAL TREASURE films. His last film was LAST VEGAS in 2013, which was called a HANGOVER for old guys. What he delivered here is a very lame thriller. Don’t waste your time on this imposter to the throne. Wait for it to come to TV, which should be fairly soon. Watch the review recorded on Facebook Live in RTHK Radio 4’s studio on Thursday, August 16th at 8:30 am HK time! It definitely should have been something.